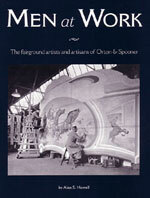 A book about fairground ride builders Orton & Spooner and the artistry of the father and son team, Albert and Sid Howell, whose work adorned many of their most famous rides. The Howells were regarded as two of the most respected fairground artists of the Twentieth Century and this book shows many examples of their huge talent, as well as paintings and drawings from their private collections. Featuring over 200 never before seen photographs from the Howell collection, many in colour, this book will be a must for anyone interested in the history of fairground rides or fairground art. Condition: Near mint. Minor damage to spine.